When associate professor Stephanie Majewski of the physics department and her colleagues were planning the upcoming Northwest Regional Conference for Undergraduate Women in Physics, they were not overwhelmed by interest in the event. They were greatly overwhelmed. Two hundred and twenty undergrads sent applications to attend the conference, 100 more than Majewski and her team expected. It was also a couple dozen more than their meeting rooms could hold, forcing them to turn some folks away from the event. “I don’t think I’ve ever seen that many female physicists together in one place ever, and I’m a physics professor,” Majewski said. The local conference takes place Jan. 12-14 on campus and is hosted by the UO physics department, the Master’s Industrial Internship Program and Women in Physics—a campus group run by graduate students. The event includes panel discussions, breakout sessions, a host of speakers and a fun Physics Slam. Students from Northern California to as far-flung as Wyoming and Montana will be in attendance. Similar conferences will be held concurrently at 11 other sites around the U.S. and Canada by the American Physics Society, and the UO wasn’t the only location to see a surge in demand. Overall, more than 1,800 people combined will be attending the conferences, a gain of nearly 500 over last year’s attendance totals. The conference’s 14-person organizing committee, which includes faculty, grad students, undergrads and administrators, began planning for the event a year ago and reaching out to inspiring women in chemistry, physical chemistry or physics to speak at the event. That includes the UO’s Geri Richmond, the presidential chair in science and professor of chemistry who was also just elected to lead Sigma Xi, the world’s largest multidisciplinary honor society for scientists and engineers. Other speakers include Mary James, the dean for institutional diversity at Reed and a keynote from Patricia Burchat of Stanford University, Majewski’s adviser when she was working toward her doctorate. Attendees will have a wide variety of panel topics to choose from, including how to communicate science, keys to succeeding in grad school, LGBTQ issues in physics and more, including a virtual tour of the Large Hadron Collider. Also part of the conference is the Physics Slam, where six UO faculty members have to explain their research in 10 minutes. “And it has to be accessible to the general public,” Majewski said. Conference attendees serve as judges in this free event that is open to the public and begins at 7:30 p.m. Jan. 12 in Room 156, Straub Hall. The theme of the conference’s final day shifts to career building both in academia and industry. One panel includes Haley Sharp, planetarium director of the Science Factory, and Asher Tubman, a physics teacher at South Eugene High School, among others. 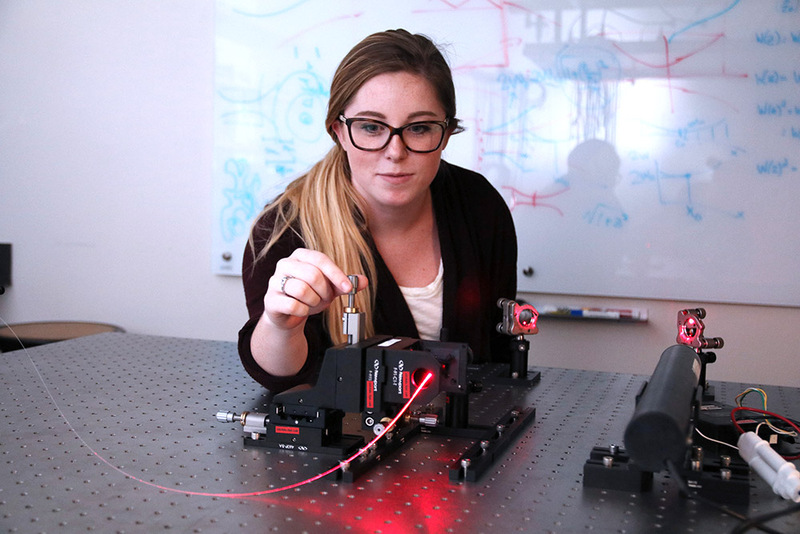 “They all have different careers, but they have physics as a common theme,” Majewski said. The first such conference in this series was held in 2006 at the University of Southern California, and it has steadily grown since then. This marks the second time the UO has hosted the Northwest regional gathering. The last time was in 2011 in Portland. The conference comes at a time when the UO is making a big push to further undergraduate research across campus. The Center for Undergraduate Research formally launched this fall, providing a clearinghouse for undergrad research opportunities. The Undergraduate Research Symposium, held each spring, has seen skyrocketing growth in the number of students seeking to present their work to the campus community.